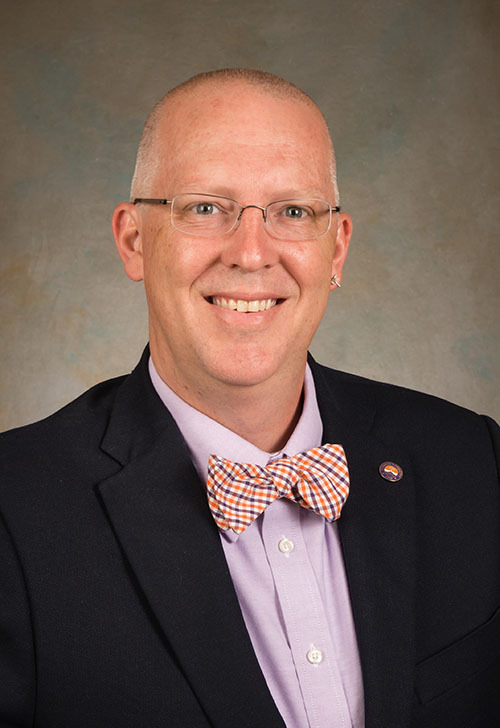 Joshua D. Summers, Professor in Mechanical Engineering and named College IDEaS Professor at Clemson University, co-directs the CEDAR Group (Clemson Engineering Design Applications and Research). Dr. Summers earned his Ph.D. in Mechanical Engineering from Arizona State University researching design automation. Dr. Summers received his BSME and MSME from the University of Missouri-Columbia working on VR-based submarine design. Dr. Summers has worked at the Naval Research Laboratory (VR Lab and Naval Center for Applied Research in Artificial Intelligence) and served on the Foreign Relations/Armed Services staff of Senator John D. Ashcroft. Dr. Summers’ research has been funded (~$6M) by government (NASA, NSF, US Army TACOM), large industry (BMW, Michelin, General Motors), and small-medium sized enterprises (Wright Metal Products, Hartness International, and others). Dr. Summers’ areas of interest include collaborative design, knowledge management, and design enabler development with the overall objective of improving design through collaboration and computation. The work has resulted in well over 220 peer reviewed publications. Dr. Summers teaching interests has resulted in introduction of four new courses in engineering design, revamping of the senior design program, and the introduction of an international study abroad experience for senior engineers. This research and teaching has been recognized with awards from SAE (Ralph Teetor Award and Arch T. Colwell Merit Award), TMCE (Outstanding Researcher Award), Innovision (Innovations in Education), the South Carolina Governor’s Award for Scientific Awareness, and others. Most significantly, Dr. Summers has been the advisor of record for five post-doctoral students, 6 completed PHD dissertations, 33 MS theses, 5 MS projects, two honor’s undergraduate thesis, and currently supervises over twenty graduate and undergraduate students. All four of his former post-doctoral advisees that completed their service and one PHD student are currently in academic positions at Clemson University, Texas State University, St. Louis University, North Texas University, and Florida Tech. CAD/CAM, Design Theory, Collaborative Design, Distributed Engineering, Concurrent Engineering, Virtual Reality, Geometric Computing, Knowledge Management, and Design Education. Veisz, D., Namouz, E., Joshi, S., Summers, J., (2013), “Computer-Aided Design versus Sketching: An Exploratory Study”, Artificial Intelligence in Engineering Design Analysis and Manufacturing, 26 (3), pp. 317-335, DOI: 10.1017/S0890060412000170. Mathieson, J., Wallace, B., Summers, J., (2012), “Estimating Assembly Time with Connective Complexity Metric Based Surrogate Models”, International Journal of Computer Integrated Manufacturing, on-line May 21, 2012, DOI: 10.1080/0951192X.2012.684706. Smith, G., Richardson, J., Summers, J., Mocko, G., (2012), “Concept Exploration Through Morphological Charts: An Experimental Study”, Journal of Mechanical Design, 134 (5), DOI: 10.1115/1.4006261. Shankar, P., Morkos, B., Summers, J. (2012), “Reasons for Change Propagation: A Case Study in an Automotive OEM”, Research in Engineering Design, 23 (4), ppl 291-303 (DOI: 10.1007/s00163-012-0132-2). Ju, J., Summers, J., Ziegert, J., Fadel, G., (2012), “Design of Honeycombs for Modulus and Yield Strain in Shear”, ASME Transactions; Journal of Engineering Materials and Technology, 134 (1), (15 pages). DOI:10.1115/1.4004488. Hannah, R., Joshi, S., Summers, J., (2011), “A User Study of Interpretability of Engineering Design Representations”, Journal of Engineering Design, 23 (6), pp. 443-68. DOI: 10.1080/09544828.2011.615302. Sen, C., Summers, J., Mocko, G., (2011), “A Protocol to Formalise Function Verbs to Support Conservation-Based Model Checking”, Journal of Engineering Design, 22 (11/12), pp. 765-788. DOI: 10.1080/09544828.2011.603295. Ju, J., Summers, J., (2011), “Compliant Hexagonal Periodic Lattice Structures Having Both High Shear Strength and High Shear Strain”, Materials and Design, 32 (2), pp. 512-524, dx.doi.org/10.1016/j.matdes.2010.08.029. Sen, C., Ameri, F., Summers, J., (2010), “An Entropic Method for Sequencing Discrete Design Decisions”, ASME Transactions; Journal of Mechanical Design, 132 (10), DOI: 10.1115/1.4002387. Sen, C., Summers, J., Mocko, G., (2010), “Topological Information Content and Expressiveness of Function Models in Mechanical Design”, Journal of Computing and Information Science in Engineering, 10 (3), DOI: 10.1115/1.3462918. Summers, J., Shah, J., (2010), “Mechanical Engineering Design Complexity Metrics: Size, Coupling, and Solvability”, Journal of Mechanical Design, 132 (2), (doi:10.1115/1.4000759). Ostergaard, K., Summers, J., (2009), “Development of a Systematic Classification and Taxonomy of Collaborative Design Activities”, Journal of Engineering Design, 20 (1), pp. 57-81.